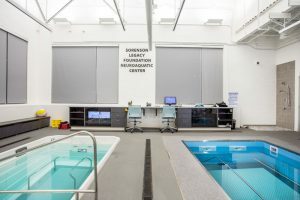 For the past 10 years, Neuroworx (a nonprofit, community-based, outpatient physical therapy clinic focusing on neurological rehabilitation) has been grabbing headlines with their unique business model and amazing stories of helping and healing. These life-changing stories seem to amass for Neuroworx as quickly as their clientele. When we visited with them earlier this year, therapists Rick Reigle and Matt Hanson shared with us a few meaningful case studies, mostly around their younger patient population, in which aquatic therapy has been a key component of patient care. Rick also told us about a recent experience with a 14-month old who had experienced a fall. “Just recently, a former Neuroworx employee brought her 14-month old son in for therapy. He was born with hypoplastic left heart syndrome. He had been up and walking but then took a pretty hard fall. After that, he just refused to walk. Rick continues: “On a personal note, my three-year-old nephew broke his leg and was in a Spica cast for about eight weeks. We had him in the HydroWorx pool the day he got the cast off. He was very, very hesitant and very fearful to put any weight on that leg. He had been immobile for eight weeks! Duchenne Muscular Dystrophy (DMD) is one of nine types of MD and is caused by the absence of dystrophin protein which holds the skeletal and heart muscles intact. Patients lose muscle function rapidly. Because of this, those who suffer from the disease usually lose the ability to walk by 12-14 years of age and pass away generally into their early 20’s. Neuroworx DPT Matt Hanson cited a 30-year old patient who, last August, suffered a T-12 thoracic spinal cord injury when he flipped his mountain bike during a trail ride. This patient previously worked as a ski instructor and is an avid outdoorsman. Matt says, “He completed rehab and, when he hadn’t progressed as far as he thought he could, he came to us. He had an iron will to get back to his job.